It's Nurses' Week. I work with a lot of nurses, right? So I thought I'd make something special for them. 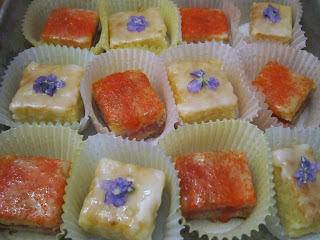 Inspired by the cupcakes with the candied violets (yes, it is ALSO Teachers' Week) I thought about petit fours. I researched various recipes, got the basic idea, and then set aside a couple of chunks of time today to get these made. First: I baked that same white cake I like so much. I think I've now made this recipe 4 times in the past 2 weeks. This time it was baked in a 10x10 pan. Easy peasy. I left it to cool while I went out to the eye doctor. For the record, I now need reading glasses. I am...okay? with this. Maybe. It's not like I didn't know it was coming. But, I digress. I got home and cut the cake in half. Then I sliced each half-cake horizontally, to make two thin layers for each. 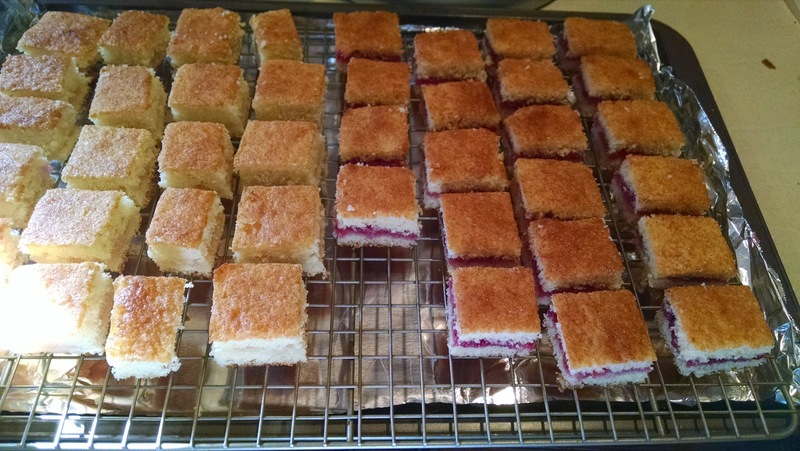 One half-cake got violet jelly and the other got raspberry jam. 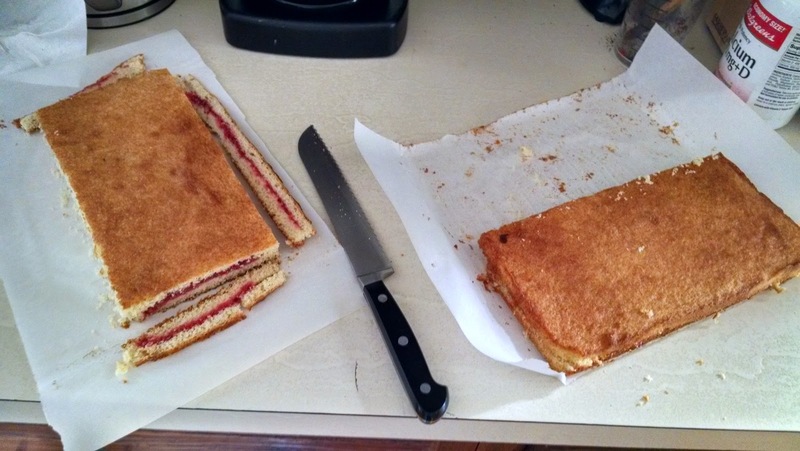 The edges were trimmed off and then the cake was cut into little cubes. Some were more little than others. Let's just say that they are not all "bite-sized." Unless your mouth is huge. Next, I made a white chocolate ganache. I had 14 oz. of white chocolate which I chopped up and whisked with 14 fluid ounces of heated heavy cream. I cooled it, but probably not enough. It wouldn't coat a test-petit-four. Frustrated, and sticky, I put the ganache aside. And made a glaze. 1 pound of confectioners sugar and a bit of water. And spooned it over the cakes. And spooned it again, and again, scooping it up from the plate below and pouring it back over. 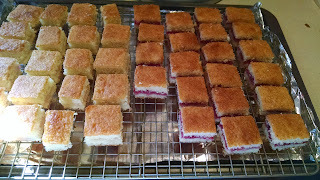 When I finally got the sides covered, at least for the violet cakes, I went back to the ganache and tried again. I at least got everything covered, but you can see the cake through the glaze. I'm not sure I like that. I am a perfectionist. The violet cakes have little candied violets on them. The raspberry cakes have red sprinkles. The petit fours are in the fridge, chilling. I think I need to chill, too. Lessons: Chill the cakes before coating them, maybe the glaze and/or ganache will stick better. There is no reason to ever use white chocolate. Just use dark chocolate. It's prettier and it tastes better. Lastly, make sure you have several hours of uninterrupted time, when you don't also have hungry kids and adults trying to get snacks and do stuff on the computer and otherwise breathe all around you. Maybe they look better than I think they do. After all, I am a perfectionist. I would eat them. But now understand your lament earlier. Thank you. They taste good, but they are sticky. I will have to try something else.